James Arthur Lovell Jr. (/ˈlʌvəl/; born March 25, 1928) is a former NASA astronaut, Naval Aviator, and retired Navy captain. Lovell is known for being the commander of the ill-fated Apollo 13 mission, which suffered a critical failure en route to the Moon but was brought back safely to Earth through the efforts of the crew and mission control. In addition to being part of the Apollo 13 crew, Lovell was the command module pilot of Apollo 8, the first Apollo mission to enter lunar orbit. Born in 1928 in Cleveland, Ohio, James Lovell was the only child of his mother Blanche (Masek), who was of Czech descent, and his father, James, Sr., an Ontario, Canada-born coal furnace salesman, who died in a car accident in 1933. For about two years, Lovell and his mother lived with a relative in Terre Haute, Indiana. After relocating with his mother to Milwaukee, Wisconsin, he graduated from Juneau High School. A member of the Boy Scouts during his childhood, Lovell eventually achieved Eagle Scout, the organization's highest level. Lovell became interested in rocketry and built flying models as a boy. After graduating from high school, he attended the University of Wisconsin–Madison for two years under the "Flying Midshipman" program from 1946 to 1948. While at Madison, he played football and pledged to the Alpha Phi Omega fraternity. While Lovell was attending pre-flight training in the summer of 1948, the navy was beginning to make cutbacks in the program, and cadets were under a great deal of pressure to transfer out. There were concerns that some or most of the students who graduated as Naval Aviators would not have pilot billets to fill. This threat persisted until the outbreak of the Korean War in 1950. Lovell applied and was accepted to the United States Naval Academy in the fall of 1948. During his first year he wrote a treatise on the liquid-fueled rocket engine. He attended Annapolis for the full four years, graduating as an ensign in the spring of 1952 with a B.S. degree. He then went to flight training at NAS Pensacola from October 1952 to February 1954. In 1952, following his graduation from the Naval Academy, Lovell married his high school sweetheart, Marilyn Lillie Gerlach (born July 11, 1930), the daughter of Lillie (née Nordrum) and Carl Gerlach. The two had attended Juneau High School in Milwaukee. While she was a college student, Gerlach transferred from Wisconsin State Teachers College to George Washington University in Washington D.C. so she could be near him while he was training in Annapolis. The couple have four children: Barbara, James, Susan, and Jeffrey. The 1995 film Apollo 13 portrayed the family's home life during the Apollo 13 mission of 1970 with actress Kathleen Quinlan being nominated for a supporting actress Oscar for her performance as Marilyn Lovell. In 1999 the Lovell family opened "Lovell's of Lake Forest", a fine dining restaurant in Lake Forest, Illinois. The restaurant displayed many artifacts from Lovell's time with NASA, as well as from the filming of Apollo 13. The restaurant was sold to son and executive chef James ("Jay") in 2006. The restaurant was put on the market for sale in February 2014 and closed in April 2015, with the property auctioned the same month. Lovell was designated a Naval Aviator on February 1, 1954. Upon completion of pilot training, he was assigned to VC-3 at Moffett Field near San Francisco, California. From 1954 to 1956 he flew F2H-3 Banshee night fighters. This included a WestPac deployment aboard the carrier USS Shangri-La, when the ship emerged from refit as only the second USN carrier with the new angled deck. Upon his return to shore duty, he was reassigned to provide pilot transition training for the F3H Demon. In January 1958, Lovell entered a six-month test pilot training course at what was then the Naval Air Test Center (now the U.S. Naval Test Pilot School) at Naval Air Station Patuxent River, Maryland. Two of his classmates were Charles (Peter) Conrad and Wally Schirra; Lovell graduated first in his class. Later that year, Lovell, Conrad, and Schirra became three of 110 military test pilots selected as potential astronaut candidates for Project Mercury. Schirra went on to become one of the Mercury Seven, with Lovell and Conrad failing to make the cut for medical reasons: Lovell because of a temporarily high bilirubin count in his blood and Conrad for refusing to take the second round of invasive medical tests. At NAS Patuxent River, Lovell was assigned to Electronics Test (later Weapons Test), with his assigned call sign being "Shaky", a nickname given him by Conrad. He became F4H program manager, during which time John Young served under him. In 1961 he received orders for VF-101 "Detachment Alpha" as an F4H instructor for the first East Coast squadron personnel assigned to that aircraft. In 1962 NASA needed a second group of astronauts for the Gemini and Apollo programs. Lovell applied a second time and was accepted into NASA Astronaut Group 2, "The New Nine", as was Conrad. Lovell was selected as backup pilot for Gemini 4. This put him in position for his first space flight three missions later, as pilot of Gemini 7 with Command Pilot Frank Borman in December 1965. The flight's objective was to evaluate the effects on the crew and spacecraft from fourteen days in orbit. This fourteen-day flight set an endurance record making 206 orbits. It was also the target vehicle for the first space rendezvous with Gemini 6A. Lovell was later scheduled to be the backup command pilot of Gemini 10. But after the deaths of the Gemini 9 prime crew Elliot See and Charles Bassett, he replaced Thomas P. Stafford as backup commander of Gemini 9A. This again positioned Lovell for his second flight and first command, of Gemini 12 in November 1966 with Pilot Buzz Aldrin. This flight had three extravehicular activities, made 59 orbits, and achieved the fifth space rendezvous and fourth space docking with an Agena target vehicle. This mission was successful because it proved that humans can work effectively outside the spacecraft, paved the way for the Apollo missions, and helped reach the goal of getting man on the Moon by the end of the decade. Lovell was originally chosen as Command Module pilot (CMP) on the backup crew for Apollo 9 along with Neil Armstrong as commander and Buzz Aldrin as lunar module pilot (LMP). Apollo 9 was planned as a high-apogee Earth orbital test of the Lunar Module (LM). Lovell later replaced Michael Collins as CMP on the Apollo 9 prime crew when Collins needed to have surgery for a bone spur on his spine. This reunited Lovell with his Gemini 7 commander Frank Borman, and LM pilot William Anders. Construction delays of the first manned LM prevented it from being ready in time to fly on Apollo 8, planned as a low Earth orbit test. It was decided to swap the Apollo 8 and Apollo 9 prime and backup crews in the flight schedule so that the crew trained for the low-orbit test could fly it as Apollo 9, when the LM would be ready. A lunar orbital flight, now Apollo 8 replaced the original Apollo 9 medium Earth orbit test. Borman, Lovell and Anders were launched on December 21, 1968, becoming the first men to travel to the Moon. As CM Pilot, Lovell served as the navigator, using the spacecraft's built-in sextant to determine its position by measuring star positions. This information was then used to calculate required mid-course corrections. The craft entered lunar orbit on Christmas Eve and made a total of ten orbits, most of them circular at an altitude of approximately 70 miles (110 km) for a total of twenty hours. They broadcast black-and-white television pictures of the lunar surface back to Earth. Lovell took his turn with Borman and Anders in reading a passage from the Biblical creation story in the Book of Genesis. They began their return to Earth on Christmas Day with a rocket burn made on the Moon's far side, out of radio contact with Earth. (For this reason, the lunar orbit insertion and trans-Earth injection burns were the two most tense moments of this first lunar mission.) When contact was re-established, Lovell was the first to announce the good news, "Please be informed, there is a Santa Claus." The crew splashed down safely on Earth on December 27. Lovell was backup commander of Apollo 11 and was scheduled to command Apollo 14. Instead, he and his crew swapped missions with the crew of Apollo 13, as it was felt the commander of the other crew, Alan Shepard, needed more time to train after having been grounded for a long period by an ear problem. Lovell lifted off aboard Apollo 13 on April 11, 1970, with CM Pilot Jack Swigert and LM Pilot Fred Haise. He and Haise were to land on the Moon. During a routine cryogenic oxygen tank stir in transit to the Moon, a fire started inside an oxygen tank. The most probable cause determined by NASA was damaged electrical insulation on wiring that created a spark that started the fire. Liquid oxygen rapidly turned into a high-pressure gas, which burst the tank and caused the leak of a second oxygen tank. In just over two hours, all on-board oxygen was lost, disabling the hydrogen fuel cells that provided electrical power to the Command/Service Module Odyssey. This required an immediate abort of the Moon landing mission; the sole objective now was to safely return the crew to Earth. Apollo 13 was the second mission not to use a free return trajectory, so that they could explore the western lunar regions. Using the LM as a "life boat" providing battery power, oxygen, and propulsion, Lovell and his crew re-established the free return trajectory that they had left, and swung around the Moon to return home. Based on the flight controllers' calculations made on Earth, Lovell had to adjust the course twice by manually controlling the Lunar Module's thrusters and engine. Apollo 13 returned safely to Earth on April 17. Lovell is one of only three men to travel to the Moon twice, but unlike John Young and Eugene Cernan, he never walked on it. He accrued over 715 hours, and had seen a total of 269 sunrises from space, on his Gemini and Apollo flights. This was a personal record that stood until the Skylab 3 mission in July through September 1973. Apollo 13's flight trajectory gives Lovell, Haise, and Swigert the record for the farthest distance that humans have ever traveled from Earth. Along with Jeffrey Kluger, Lovell wrote a book about the Apollo 13 mission, Lost Moon: The Perilous Voyage of Apollo 13. It was the basis for the Ron Howard movie Apollo 13. Lovell's first impression on being approached about the film was that Kevin Costner would be a good choice to portray him, given the physical resemblance, but Tom Hanks was cast in the role. In order to prepare, Hanks visited Lovell and his wife at their home in Texas and even flew with Lovell in his private airplane. In the film, Lovell has a cameo as the captain of the USS Iwo Jima, the naval vessel that led the operation to recover the Apollo 13 astronauts after their successful splashdown. Lovell can be seen as the naval officer shaking Hanks' hand, as Hanks speaks in voice-over, in the scene where the astronauts come aboard the Iwo Jima. Filmmakers initially offered to make Lovell's character an admiral aboard the ship (presumably Rear Admiral Donald C. Davis, Commander Task Force 130 (CTF 130), who was the senior officer aboard and welcomed them home). However, Lovell said "I retired as a Captain and a Captain I will be." He was cast as the ship's skipper, Captain Leland E. Kirkemo. Along with his wife Marilyn, who also has a cameo in the film, he provided a commentary track on both the single disc and the two-disc special edition DVD. He has served on the Board of Directors for several organizations, including Federal Signal Corporation in Chicago (1984–2003), Astronautics Corporation of America in his hometown of Milwaukee (1990–1999), and Centel Corporation in Chicago (1987–1991). Lovell also visits colleges and universities where he gives speeches on his experiences as an astronaut and businessman. He strongly urges students to get involved in science and the space program, and he credits NASA in the 1960s with bringing much of the country together for a common goal. Lovell Court is a street in the North Harbour Industrial Estate on the north shore of Auckland, New Zealand. Several streets in the area have names whose origins honor the US Apollo and Space Shuttle programs, including Armstrong Drive, Columbia Place, John Glenn Avenue, and Ride Way. In 1982, Lovell was one of ten Gemini astronauts inducted into the International Space Hall of Fame. About a month after the return to Earth of Apollo 13, Lovell and his crewmates, Fred Haise and Jack Swigert, appeared on The Tonight Show with host Johnny Carson. The introduction of this segment of the show is featured on Lost Moon: The Triumph of Apollo 13 on the single disc DVD version of the movie. In 1976, Lovell made a cameo appearance in the Nicolas Roeg movie The Man Who Fell to Earth. In 1995, actor Tom Hanks portrayed Lovell in the film Apollo 13, based on Lovell's book Lost Moon. Lovell himself makes a cameo in this movie, playing the captain of the USS Iwo Jima at the end of the film. In 1998, actor Tim Daly portrayed Lovell in portions of the HBO miniseries From the Earth to the Moon. 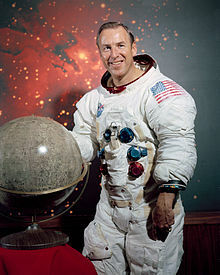 The film depicts Lovell during his missions aboard Gemini 12, Apollo 8, and Apollo 13, though he is not seen on screen during the latter mission. On July 20, 2014, the 45th anniversary of Apollo 11's landing on the Moon, CBS Sunday Morning correspondent Lee Cowan and his crew did a piece called "Astronaut wives: The other space pioneers" featuring James Lovell and his wife Marilyn. They celebrated their 62nd wedding anniversary in June. In 2018, actor Pablo Schreiber portrayed Lovell in the film First Man. ^ a b c d e f g h i j k l m n o p q "Astronaut Bio: James A. Lovell". Retrieved December 16, 2016. ^ a b c Burgess, Colin. "Selecting the Mercury Seven: The Search for America's First Astronauts". books.google.ca. Retrieved March 18, 2018. ^ "Collecting the Final Frontier: Ohio Historical Society's Collections Blog". ohiohistory.org. Archived from the original on March 31, 2012. ^ "Newsletter Spring 2000: Notable Americans with Czech Roots". afocr.org. Archived from the original on January 23, 2008. Retrieved November 29, 2007. ^ Townley, Alvin (December 26, 2006). Legacy of Honor: The Values and Influence of America's Eagle Scouts. New York: St. Martin's Press. pp. 80–86. ISBN 0-312-36653-1. ^ a b c d Lovell, Jim; Kluger, Jeffrey (1995). Apollo 13: Lost Moon. New York: Pocket Books. ISBN 0-671-53464-5. ^ "Lovell, Haise married high school sweethearts". The Bryan Times. Bryan, Ohio. UPI. April 10, 1970. Retrieved March 18, 2018 – via Google News. ^ Brugmann, Bruce B. (September 18, 1962). "Selection of Lovell Puts Kin Into Orbit". The Milwaukee Journal. Milwaukee, Wisconsin. Retrieved March 18, 2018 – via Google News. ^ "Lovells of Lake Forest". Lovells of Lake Forest. Retrieved June 9, 2013. ^ Blaser, Linda (February 19, 2014). "Lovell family confirms sale of Lake Forest restaurant". Lake Forester. Archived from the original on February 22, 2014. Retrieved July 30, 2015. ^ "Lovells of Lake Forest Easter Brunch Sunday, April 5, 2015". lovellsoflakeforest.com. Archived from the original on April 29, 2015. Retrieved March 18, 2018. ^ "The Golden Eagles, Regulars: James A. Lovell jr, Capt USN (Ret)" (PDF). epnaao.com. Retrieved March 18, 2018. ^ Goldberg, Jan. "James Lovell: The Rescue of Apollo 13". books.google.com. Retrieved March 18, 2018. ^ Evans, Ben. ""The Best All-Around Group": NASA's Astronauts of '62". AmericaSpace. Retrieved February 12, 2018. ^ "Rendezvous in Space: The Launch of Gemini 7 | Drew Ex Machina". Retrieved April 2, 2017. ^ "Gemini 7, NSSDCA/COSPAR ID: 1965-100A". NASA Space Science Data Coordinated Archive. Retrieved May 28, 2017. ^ "Selecting and Training Crews". history.nasa.gov. Retrieved March 18, 2018. ^ Ertel, Ivan D.; Newkirk, Roland W.; et al. (1969–1978). "Part 2 (N): Recovery, Spacecraft Redefinition, and First Manned Apollo Flight: August through September 1968". The Apollo Spacecraft: A Chronology. IV. Washington, D.C.: NASA. LCCN 69060008. OCLC 23818. NASA SP-4009. Archived from the original on February 5, 2008. Retrieved January 29, 2008. ^ "The Apollo 8 Christmas Eve Broadcast". NASA. Retrieved December 29, 2017. ^ "Apollo 8: Christmas at the Moon". NASA. December 18, 2014. Retrieved December 29, 2017. ^ Slayton, Donald K. "Deke"; Cassutt, Michael (1994). Deke! U.S. Manned Space: From Mercury to the Shuttle (1st ed.). New York: Forge. p. 236. ISBN 0-312-85503-6. ^ "Apollo 13". NASA. July 8, 2009. Retrieved December 29, 2017. ^ McKie, Robin (April 16, 2017). "Apollo 13: celebrating the unsung heroes of mission control". The Guardian. Retrieved December 29, 2017. ^ Cortright, Edgar M. (June 15, 1970), Report of the Apollo 13 Review Board (PDF), Washington, D.C.: NASA Text (.TXT) file of report here. Multi-part PDF files of the report are available here Archived June 6, 2013, at the Wayback Machine and here Archived May 18, 2013, at the Wayback Machine. ^ Chaikin 2008, p. 298. ^ Chaikin 2008, pp. 304–305. ^ Chaikin 2008, pp. 314, 322. ^ Chaikin 2008, p. 611. ^ The Skylab 3 crew spent 1427 hours in space, in addition to commander Alan Bean's over 244 hours on Apollo 12, giving him the second record. ^ Salgado, José Francisco (June 30, 2006). "Captain James A. Lovell Jr. Timeline" (PDF). Adler Planetarium & Astronomy Museum. Archived from the original (PDF) on November 27, 2007. Retrieved October 4, 2007. ^ Wall, Mike (April 5, 2016). "The Most Extreme Human Spaceflight Records". Space.com. ^ "Silver Buffalo Award". Boy Scouts of America: Buckeye Council. Retrieved December 26, 2017. ^ Apollo 13: 2-Disc Anniversary Edition (Disc 1), Special Features:Commentary track by Jim and Marilyn Lovell (DVD). Universal Studios. March 19, 2005. ^ "NASA photographic archive". Grin.hq.nasa.gov. Archived from the original on March 6, 2013. Retrieved June 9, 2013. ^ "Apollo 13 Full Cast and Crew". IMDb. Retrieved December 29, 2017. ^ "Astronautics Timeline". Retrieved December 16, 2016. ^ "Federal Signal Corporation Announces Board of Director Changes: Election of Robert M. Gerrity and Robert S. Hamada; Retirement of James A. Lovell Jr". Retrieved December 16, 2016. ^ "J. Peter Morris was named chairman, Edmond V. Russ was..." Chicago Tribune. May 18, 1987. Retrieved December 16, 2016. ^ "Lovell". Retrieved December 16, 2016. ^ "Lovell (crater) : Who, What, Where, When". Servinghistory.com. Retrieved December 3, 2012. ^ "north james lovell street – Google Maps". Maps.google.com. January 1, 1970. Retrieved June 9, 2013. ^ Hintz, Martin (2000). Wisconsin Portraits: 55 People who Made a Difference. Big Earth Publishing. p. 91. ISBN 9780915024803. OCLC 44508414. Retrieved August 27, 2013. Discovery World, next to the Milwaukee Public Museum, is also named the James Lovell Museum of Science, Economics and Technology. The former astronaut attended the ribbon-cutting ceremony in 1996. At the same time, Milwaukee's 7th Street outside the museum was renamed James Lovell Street. ^ "North Harbour Industrial Estate in Upper Harbour – Auckland". Retrieved January 17, 2017. ^ Library, C. N. N. "James Lovell Fast Facts". CNN. Retrieved April 2, 2017. ^ "Jim Lovell | Our History". history.oa-bsa.org. Retrieved April 2, 2017. ^ "Silver Buffalo Award Winners 1999-1990". scouting.org. Retrieved March 18, 2018. ^ "Lambda Omicron Chapter Namesakes". wvualphaphiomega.webs.com. Archived from the original on April 9, 2015. Retrieved March 18, 2018. ^ "Richard Nixon: Remarks on Presenting the Robert H. Goddard Memorial Trophy to the Apollo 8 Astronauts". www.presidency.ucsb.edu. Retrieved April 2, 2017. ^ "Ex-astronaut Talks to Grads at Ceremonies". The Herald-News. Passaic, New Jersey. June 17, 1974. p. 9 – via Newspapers.com. ^ "James Lovell Received NASA's Ambassador of Exploration Award". nasa.gov. Retrieved March 18, 2018. ^ Morrell, Margot; Capparell, Stephanie (January 8, 2001). Shackleton's Way: Leadership Lessons from the Great Antarctic Explorer. Penguin. ^ "General James E. Hill Lifetime Space Achievement Award". spacefoundation.org. Retrieved March 18, 2018. ^ "Space Foundation Survey Reveals Broad Range of Space Heroes". Archived from the original on August 15, 2012. ^ "Laureates Alphabetically". The Lincoln Academy of Illinois. ^ "Person of the Year Astronauts Anders, Borman and Lovell: 1968". content.time.com. ^ iPad iPhone Android TIME TV Populist The Page (April 27, 1970). "Time Magazine covers: Jim Lovell". Search.time.com. Archived from the original on October 18, 2015. Retrieved June 9, 2013. ^ "Life Magazine cover: Jim Lovell". Oldlifemagazines.com. Archived from the original on November 29, 2011. Retrieved March 9, 2013. ^ "The Award of Honour Air Pilots". airpilots.org. Retrieved March 18, 2018. ^ "What is Toastmasters?". Retrieved May 4, 2016. ^ "The Man Who Fell to Earth: Full Cast and Crew". IMDb. Retrieved December 26, 2017. ^ Howell, Elizabeth (March 20, 2013). "Astronaut Jim Lovell: Apollo 13 Commander". Space.com. Retrieved December 26, 2017. ^ "C-SPAN Apollo 8 Reunion". C-spanvideo.org. April 23, 2009. Retrieved June 9, 2013. ^ "Astronaut wives: The other space pioneers". CBS News. July 20, 2014. Retrieved July 20, 2014. ^ "First Man". The Internet Movie Database. 2018. Retrieved October 18, 2018.